Ready to try the new Bb Collaborate “Ultra” for your virtual session? What is Blackboard Collaborate Ultra? A web conferencing tool that integrates with Blackboard Learn. How can I try the new Bb Collaborate Ultra? Open a service request in Team Dynamix and request Bb Collaborate Ultra be enabled in a Blackboard Learn Prep Area and give it a try. Then, if you like it, request that it be enabled in your live course section. Is it available for mobile? If students want to participate on a mobile device, they must download the Bb Student app. Anyone who is the session Moderator must use a desktop or laptop computer. I currently use an older version of Bb Collaborate. Should I switch to Ultra? Bb Collaborate Ultra is easy to use; no extra downloads or Java required. Limited recording playback; currently includes EITHER the webcam mode, or the whiteboard/application share mode, but not both at the same time. Refer to Blackboard’s Understanding the Changes reference guide for full details. Schedule a meeting with a TLP ITC consultant to go through potential use cases for Blackboard Collaborate Ultra. The YouTube Video Everywhere icon (shown below) will no longer be available in the Blackboard Learn conbtent editor as of January 21, 2016. CSU Chico decided to remove the icon in the Bb Learn text editor because of Google/YouTube’s decision to discontinue their “Record from Webcam” functionality. For background information, please refer to the TLP blog post from earlier this month. 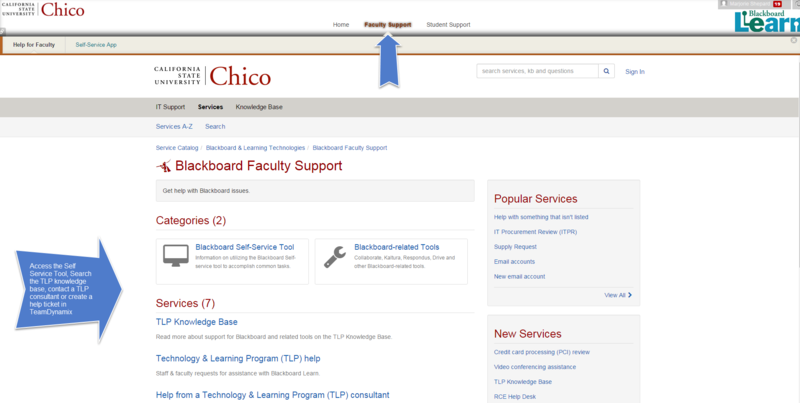 The Blackboard Learn Faculty Support tab has slimmed down for the new year. You can search the TLP knowledge base, create a help ticket in Team Dynamix, or contact a TLP Instructional Technology Consultant; all from one location. The Self-Service tool is also available from the Faculty Support tab. The Self-Service tool lets you add a guest instructor, create a prep area, or apply a template to your Blackboard Learn course. Click the image below to check it out.